BEIJING (Reuters) -- General Motors Co. is considering adding new plants in China in 2011 and after, a senior executive said today, as it moves to meet steady demand in the world's top auto market. GM is also planning to export a "substantial amount" of its Chevrolet Sail small cars from China to other emerging markets in the coming years, said Terry Johnsson, vice president of the automaker's China operations. Global industry giants, from BMW AG to Volkswagen, have racked up eye-popping sales in China, where growing national wealth has pushed auto sales to record highs. But the once-simmering market is returning to a more rational growth pattern of 10-15 percent this year after the government scrapped most of its auto incentives at the end of 2010. The Beijing city government's recent move to impose quotas on new car registrations and possibly similar moves by other big cities to tackle traffic gridlock will also apply the brakes on sales. Still, GM, which sold 2.35 million vehicles in China in 2010 and always aims to outpace the market, remains under tremendous capacity pressure this year, Johnsson told Reuters. "We sold everything we could build in 2010 and the same holds true in 2011. We could actually sell more than we will be able to (build) if we are not capacity constrained. We are actually short of capacity," he said. "The total business is going to go up by the size of a single plant. It's not just about this year. We'll have to look about a real rapid increase in our capacity." Ford Motor Co., Nissan Motor Co., and Daimler AG's Mercedes-Benz, among others, are also ramping up capacity in China, banking on robust demand in the smaller inland cities, which are replacing big urban centers as the major industry growth driver as incomes rise. China last year surpassed the United States as GM's biggest market. Even the super luxury brand Porsche is adding 10 dealerships to its 31 shops in mainland China this year to cater to demand in mid-tier cities, its China chief, Helmut Broeker. GM, which also makes light commercial vehicles in China with FAW Group, sold roughly 20 percent more vehicles in the country in January than a year earlier, mostly due to its passenger car business, Johnsson said. The automaker will release its official monthly China car sales data on Feb 9. In January 2010, GM rolled out the Chevrolet Sail, jointly developed with its partner and domestic industry champion SAIC Motor Corp. in China. 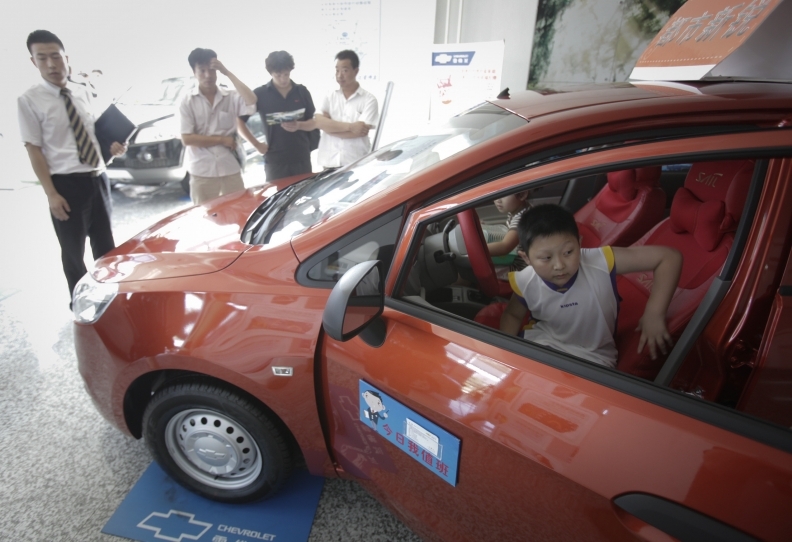 The first foreign brand with a price tag below 60,000 yuan mark ($9,100) became an instant hit in the small car segment, collecting an annual tally of 125,625 units, roughly 12 percent of GM's overall passenger car sales in the country that year. Perceiving a demand for quality and affordable small cars in other emerging markets, GM exported 5,000 of the Sail models from China in the first 10 months of last year, mostly to Chile. The volume is estimated to jump to 20,000 units or more this year, Johnsson said. "It's a strategic decision to take advantage of a vehicle that's hot right now and establish out channels in those markets. If we don't feed that demand in those market places, maybe these markets will look elsewhere," he said. So far, GM has only exported fully assembled Sail cars from China. It plans to start shipping components and have them assembled in select markets in South America this year and later in other developing countries, he added. "We have a pretty ambitious plan on the exports side. It's far beyond the numbers that we are looking at this year," Johnsson said. "We certainly would look ahead to a time we will be looking to exporting quite substantial amount of business from China."